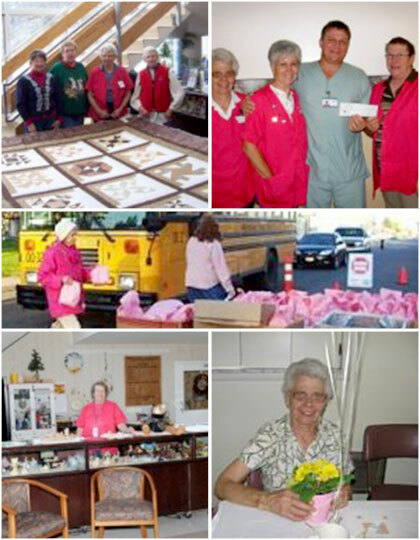 Our Pink Lady Auxiliary has been an integral part of the PCHD family since its inception in 1963. These volunteers contribute more than 3400 hours of services to the hospital and nursing home every year. They can be seen almost any day helping with resident activities, employee projects, helping in their Corner Store, or planning their next fundraising event. Each year the Auxiliary does an amazing job of raising funds. This money helps provide gifts for our residents and much needed equipment for our facility. They also provide education scholarship opportunities to individuals in our community who are pursuing an interest in healthcare. Annual fundraising events include a quilt raffle, Potato Bar, American Falls Day raffle gift baskets, Valentines Day solicitation program, Thanksgiving Pie Sales, and their Pink Lady Corner Store! If you are interested in joining the Pink Lady Auxiliary OR becoming a volunteer to help in any area of District, please fill out an online application or contact Human Resources at 208-226-3200 for more information. It’s good for you! Studies show that volunteering improves longevity, lowers depression rates, and reduces the rates of heart disease! Power County Hospital District is an Equal Opportunity Employer. PCHD does not discriminate in employment opportunities or practices on the basis of race, color, religion, gender, national origin, age, disability or any other legally protected status in accordance with all applicable federal and state regulations. Hiring is based on the individual's character, reliability, training, experience, skills, aptitude and past performance and other indications of their ability to do the work required. ©2019 Power County Hospital District. All rights reserved.